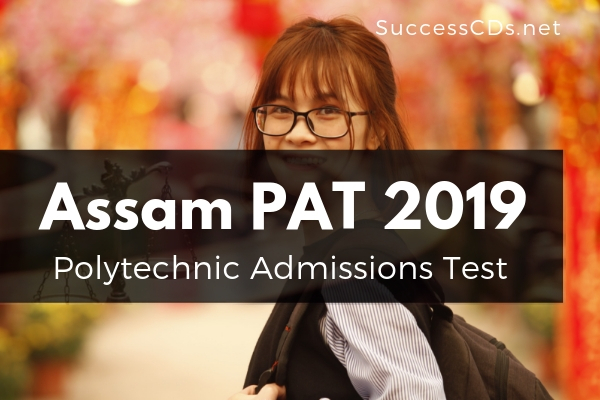 Assam Polytechnic Admission Test 2019 - Assam Polytechnic Admission Test, also known as Assam PAT 2019 is being conducted by DTE Assam. Assam Polytechnic 2019 admissions shall be done on the basis of this test for various Polytechnics/Institutions. The State Polytechnics of Assam are affiliated to the State Council for Technical Education (SCTE), Assam. The SCTE, Assam is a Council of members appointed by the Govt. of Assam to advise the Govt. in all matters relating to Technical Education in the State. The Exam Committee of the SCTE is responsible for conducting the Diploma Exams in different disciplines in Engineering and Technology offered by the Polytechnics of Assam and also to Central Institute of Technology, Kokrajhar & Dr.Bhupen Hazarika Regional Govt. Film & Television Institute, Guwahati. Candidate must pass the HSSLC (12+) or its equivalent exam in Humanities, Science or Commerce. The upper age limit for General category candidate is 20 years and 4 months on 31st December 2019. Physically Handicapped - 03% of Institute intake capacity. “C” certificate with Grading "A"
“B" certificate with Grading "A"
"A" certificate with Grading “A"